Get the latest gossip, news and facts related to celebrity wedding events here. When thinking about wedding invitations, favors, and other stuff, you can select from the variety of wedding card boxes available today. The thing is, at times, it is the simplest option that will work best for your occasion. Thus, don’t spend too much time agonizing about unique wedding card boxes for invitations. This article will provide you creative ideas to make your own wedding boxes to fill with invitations, favors, cards, and many more. 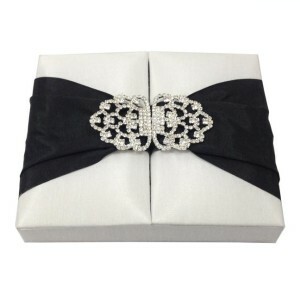 Utilize a cube style box and wrap with beautiful ribbon. Make sure to check out paper and silk flowers online or from your local craft store. Search for two flowers that you can layer over each other, for example, a flat daisy may be combined with a rose on the top. Ensure that the bottom flower has the same width as the box, while the top one should have similar width as the center of the flower in the bottom. 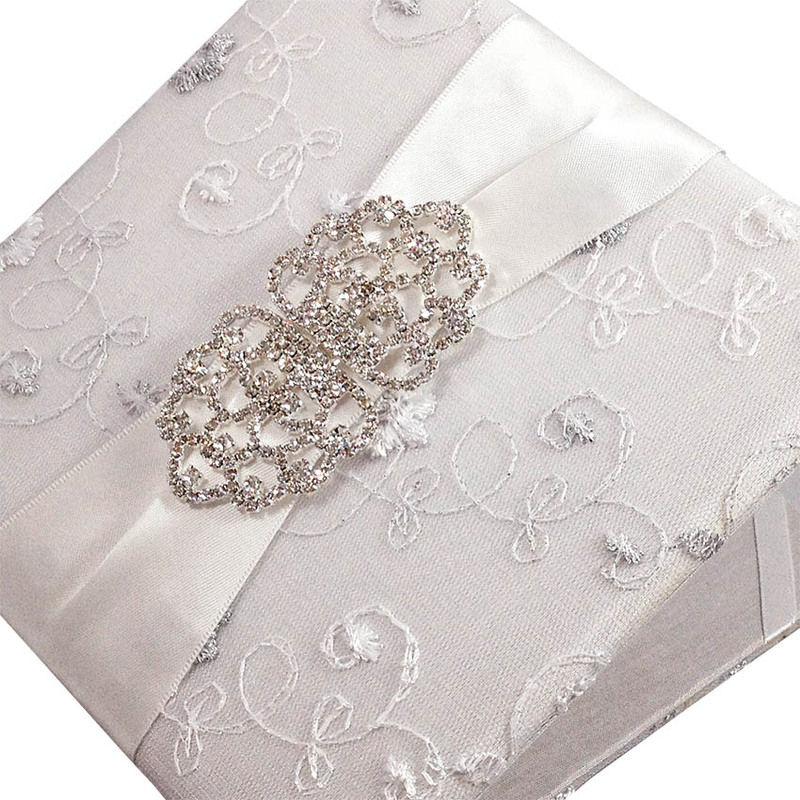 Silk invitation boxes go well with elegant, yet simple wedding. Just use a plain cube and wrap with a nice ribbon, present style. Place a feather butterfly or pretty fabric on top to complement your wedding theme and colors. For wedding cake gift boxes, select a symmetrical box shape, like rectangle, square or round. Buy a square punch in two different sizes and cards that go with the color of your preferred favor boxes. Make sure to pick coordinating hues, like pink and cream. Utilize the punches to create two squares, one each from the two distinct colors. The bigger square must come from the coordinating color, while the smaller square should come from similar color card as your box. Appropriately layer the two cuts together – the small square on large and middle on the top of your box. After positioning them, glue a pearl or small flat gem in the center. Select a medium sized satin ribbon in a matching color and wrap it around your favor boxes. Put the two ends jointly and tie in a bow style. Utilize some card in a matching hue, then cut out squares and use a decorative punch to create a shape in the center. Use beads and a small piece of craft wire; thread the beads on the craft wire and tag on at the back of the square that you cut out initially. You now have an attractive cut out shape with cute bead pieces in the center. Attach this to your wedding invitation boxes with double sided tape, ensuring that you also affixed it to the ribbon to hold it securely in place. If you are into arts, you can create a wedding monogram on your pc, or you can also draw it freehand. Incorporate your wedding date below and if there is still space, you can also add a small motif. Cut them out to go well with the shape of your wedding favor boxes, cutting them about 2mm smaller and append to the lid of the boxes. Only use card that has similar color as your favor boxes. It’s the fairytale wedding the whole world is waiting for. On Friday April 29 His Royal Highness Prince William Arthur Philip Louis of Wales will marry Miss Catherine Middleton at Westminster Abbey in London. At 11:00 a.m. (BST) the actual ceremony will begin at Westminster Abbey. Situated next to the Houses of Parliament in the centre of London, the Abbey is a colossal Gothic church that still holds daily services. It will be a poignant day for Prince William, as it was also the setting for his mother’s funeral in 1997. As well as being one of London’s major tourist attractions, Westminster Abbey is the traditional burial place for many monarchs, and has been the chosen venue for coronations since William the Conqueror in 1066. The most recent coronation was Prince William’s grandmother Queen Elizabeth the second, witnessed on television by the general public for the first time in 1953. The Dean of Westminster, the Very Reverend Dr. John Hall, has been invited to conduct the service. The Archbishop of Canterbury, Dr. Rowan Williams, will marry Miss Middleton and Prince William, and the Bishop of London, Richard Chartres will give the address. It’s one of the most talked about aspects of the royal wedding. What is the bride’s wedding dress going to be like? Modern or classical, ivory or white? Nobody knows for sure, but the biggest rumour going around is that the late designer Alexander McQueen’s creative director Sarah Burton has been given the honour of designing the royal gown. Around 1,900 guests have already been invited to the service, and more than half of these are family and friends. There will be many UK and foreign dignitaries, politicians, members of the armed forces (including soldiers injured in Iraq and Afghanistan), and representatives from different charities and faith organizations. One hundred lucky members of the British public will be invited to the service by means of a lottery draw. The guest list will also include a number of celebrities. David and Victoria Beckham are rumoured to be invited. Sir Elton John, Sir Paul McCartney, and a sprinkling of Hollywood stars will probably be in attendance, but we will have to wait and see. If you want to witness the occasion at first hand, Miss Middleton will travel by car to the wedding service from Buckingham Palace, passing The Mall, Horse Guard’s Parade, the Cenotaph, and the Houses of Parliament. (Less able people can apply online for specially designated spots along the route.) After the ceremony, she and Prince William will travel back to Buckingham Palace along the same route in a horse-drawn carriage. Pleasant temperatures are predicted for the end of April, with no rain expected to fall. If this turns out to be true, everyone should be able to get a good view of the newly-wed couple when they appear on the balcony of Buckingham Palace at around 1:30 p.m. As well as witnessing the famous couple kiss, onlookers will be treated to a flyover by the Royal Air Force. Her Majesty The Queen will host the wedding reception at Buckingham Palace. The newlyweds will probably then appreciate some time to themselves before the private dinner and dance in the evening. This event will be reserved for the closest family and friends and will be hosted by the groom’s father, Prince Charles. After spending the night at Buckingham Palace, the royal couple will finally be able to spend some precious time alone at their secret honeymoon destination. Nobody knows where this will be, but it probably won’t be a lavish affair as they want to appear more frugal in these tough economic times. The almighty gaze of the world’s media will probably have taken its toll on the royal couple by the time of their honeymoon. They need to make the most of this tranquil time alone. When they return to public duty, the whole world will once again be watching their every move. Wedding planning involves much more than just picking a venue and buying a dress. You also need to take the time to choose proper invitations, choose a theme for your wedding and find the perfect décor for the tables at your wedding reception. The first step in setting all these details in stone is to choose your wedding theme. While you may not feel like you want or need a theme for your wedding, but it will make planning easier. When you have a wedding theme in mind it gives you a place to start when choosing invitations, décor and more. If you choose to have a very formal or particularly romantic wedding, using silk favor boxes and wedding invitation boxes is one way to add some more elegance to your special day. Silk wedding fans in your chosen colors can make for great favors to give to your guests. These favors can even be personalized for each guest if you want to go all out. Providing silk flower petals for your flower girl can also be a nice touch for a formal wedding. Your guest book can also be covered in silk if you choose. 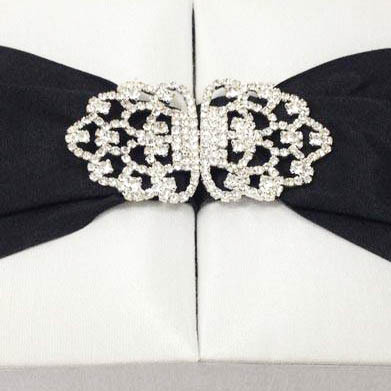 This makes for an elegant souvenir that will make your special day that much more unique. In addition, silk bridesmaids’ dresses are designed to make your bridal party look as elegant as possible. To preserve all the special memories of your wedding day having your photos and other memorabilia kept in a silk covered photo album can be a great idea as well. Many couples choose a more casual theme for their wedding and this calls for more casual décor, invitations and more. For example, if you choose to have a beach wedding you may want to choose décor that reflects that theme. This can include coral reef place card holders, bamboo coasters as wedding favors and seashell tea light holders for the tables at your wedding reception. 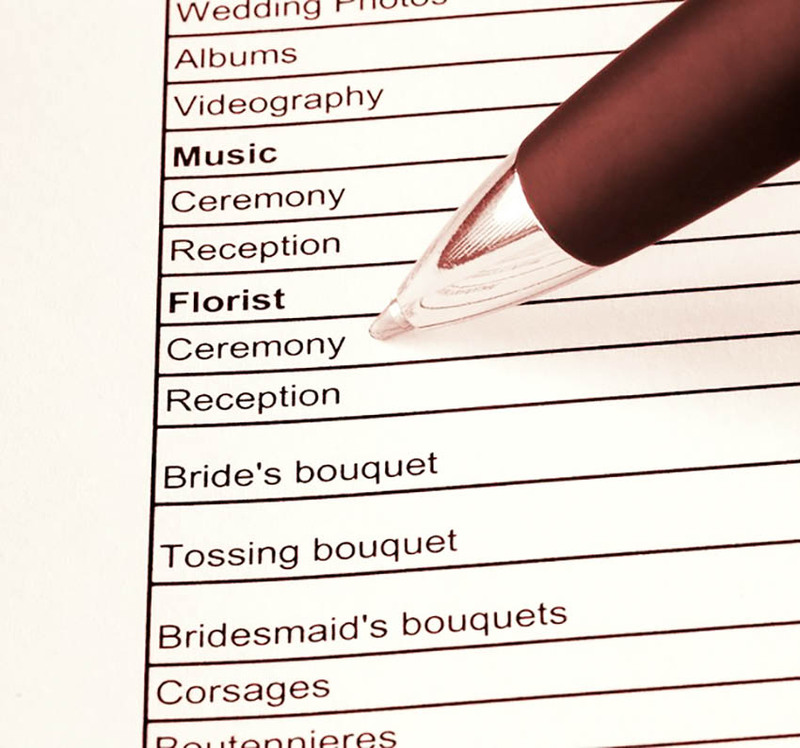 No matter what kind of wedding you choose, you will want to make sure everything is carefully coordinated. 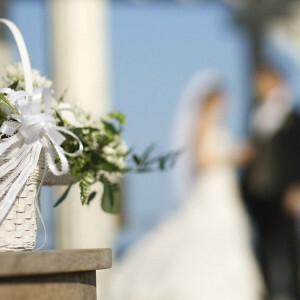 No matter what your wedding theme is every aspect of your wedding should be tied to that theme, from the décor to the favors to the wedding invitations and everything else that goes into planning your wedding. Why Would a Bride Want to Wear Flip Flops, Anyway? Who Wants To Wear Flip Flops At A Wedding? In a world driven by materialism, there will always be people who have something to say about what everyone else is wearing. At work, school, or out on the town, people are judging each other. 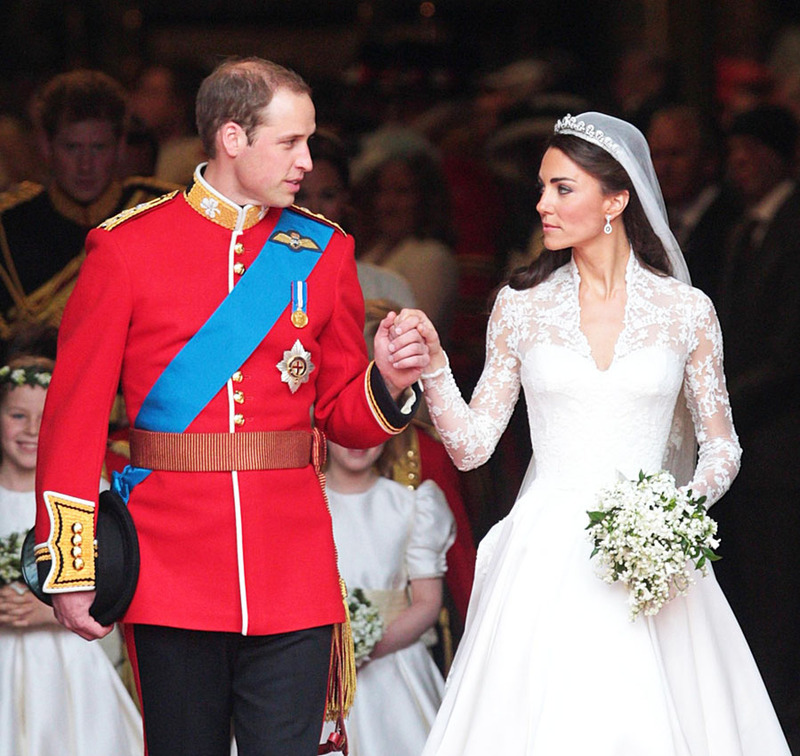 It seems that it’s no different when it comes to bridal fashion choices. Perhaps this is to be expected because weddings are seen as very important occasions. However, the only people whose opinions should matter at a wedding are the bride and groom! Although some critics might not like it, there are plenty of great reasons that a bride might want to wear flip flops at her wedding, and she should be free to do so if she pleases. The most common reason that a bride might opt for wedding flip flops is that her wedding is taking place on the beach. Of course, beaches are the classic place for this kind of footwear. Not only do flip flops fit the theme of a seaside wedding, but they also provide a lot more stability and comfort than traditional heels. There’s absolutely nothing wrong with wearing flip flops to a beach wedding, for the bride or for anyone else. While some might say that the beach is the only place that bridal flip flops are appropriate, there are plenty of reasons to disagree. Number one among these is comfort. There is truly no comparison between this kind of footwear and designer high heels. Whether a bride is trying to dance or simply walk down the aisle, she’s going to have an easier time in flip flops. Plus, her feet will thank her later. Some people think that style has to be traded away to get this kind of comfort. This is just not the case at all! While some people have to have the biggest names in designer fashions, others realize that a seemingly simple pair of bridal flip flops can be just as elegant. 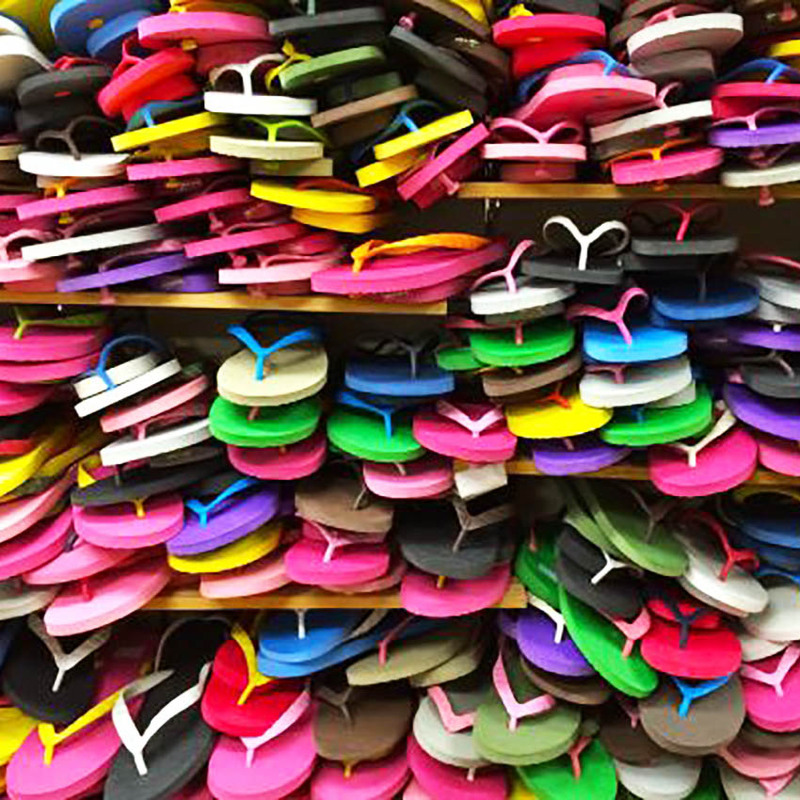 These don’t have to be the plain plastic flip flops that are found at stores like Old Navy. Instead, they can be lavishly adorned with flowers, beads, and anything else a bride might like. They are even easy to have custom-made by a local artisan or someone on a website like Etsy.com. What is more stylish than footwear that is truly one of a kind? Even completely customizing a bride’s wedding flip flops will cost less than a pair of designer shoes. 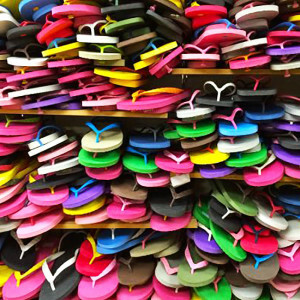 By deciding to wear flip flops, a bride can be absolutely unique while saving money. Every bride should consider bridal flip flops as a comfortable, stylish, cost-saving option for her wedding day! Invitations can be one of the most expensive parts of your wedding preparation. If you are working within a limited budget or you aim to set aside a few hundred dollars, it would be beneficial to make your own. Personalized and handmade wedding invites are easy to make, and can be as elegant and unique as you desire. Here are some tips and tricks in making elegant wedding invitations. An elegant invitation begins with the most excellent font. Look for one that fits the theme and tone of your wedding. Employ a cursive and fancy font on a flowing brush script for a celebration in the afternoon or a formal wedding in a beautiful evening. Write the wording of your invitation. You can use a rhyme, a poem, or opt for clever sayings. Because you are crafting your own invitations, you don’t have to deal with limitations. If you are having a hard time figuring out the right words for the invites, you can check free websites that recommend and offer pre-written wedding verses. Once you’ve decided on the font as well as the wording, plan the layout of the words. You can place them either justified to the left or centered in the middle of the invitation. It all depends on what appears elegant to you. Choose the invitation paper based on your wedding colors, like pastel blue or a rich pick, together with an off white or cream. Utilize the colored paper to integrate nice texture to your invitation. Print your chosen words on the white paper, then glue a larger cut of the colored paper to the back to make a border. 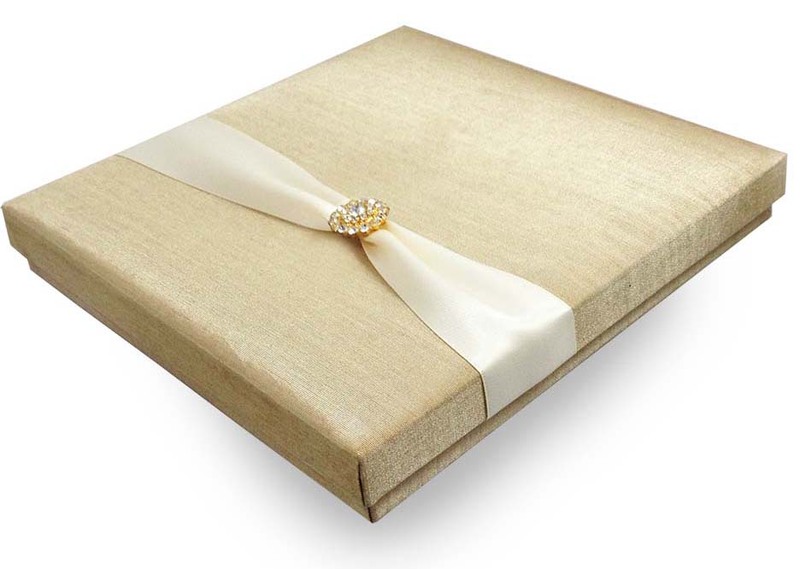 To achieve an elegant look wedding invitation boxes, try attaching a sheet of vellum paper on the top of the invitation. You can fasten it by punching two holes in the top of the paper and add a silk ribbon to strap a neat bow. This small detail will assimilate elegance to your invitation. Print your invitations using a word processing software program. Ensure that the paper size fits the size of the invites and then encode the verse in the font that you have selected. Don’t rush the printing. For best results, feed one paper at a time in your printer. 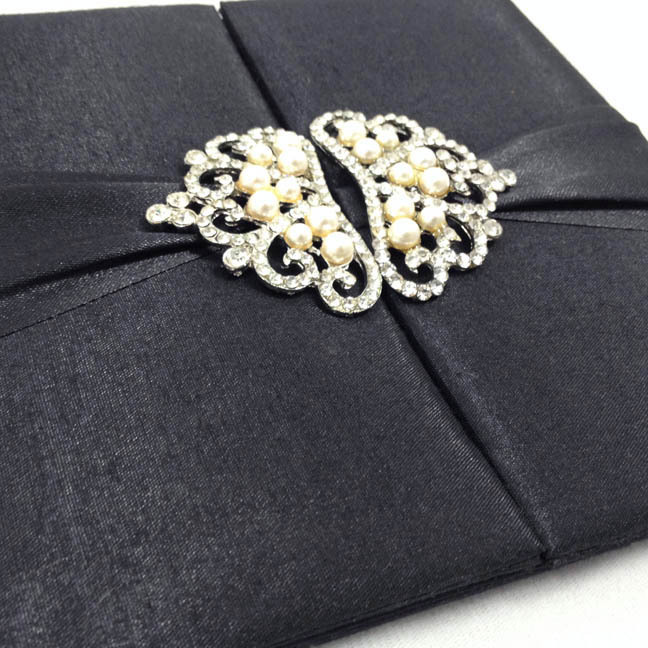 Make sure that the invitation envelopes are as elegant as the invitation itself. Address the envelopes using the same font used inside the invitation. If you would like to place some inserts like a reception card, response card, or place card, you can have them printed the same way you employed in the wedding invitations with matching font styles. Add decorative items. Pressed flowers, pre-made bows, or jewel embellishments make brilliant additions to unique wedding invitations. Place the ornamentation of your choice after you’ve printed the invitation. Remember though that the stylish font and the cardstock may be enough to make the invitation look very elegant without adding decorations and adornments. If you’re about to have a beach wedding, you can still have elegant wedding invitations by using old-fashioned and high-class wax seal on the envelopes with you and your partner’s initials stamped in the center.